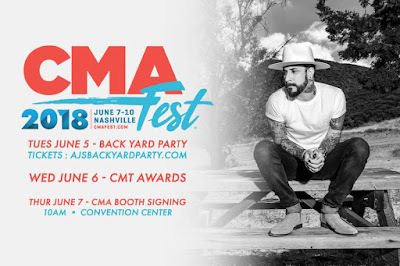 Backstreet Boys' AJ McLean to Host Backyard Fan Party During CMA Fest! The AJ McLean of Backstreet Boys fame has revealed that he will be hosting a fan party during the 2018 CMA Music Festival. AJ will perform new music from his forthcoming solo project at White Avenue Studio in Nashville on Tuesday, June 5, 2018 at 5 PM! Tickets are on sale now for $25, or $100 for VIP ticket that includes a meet and greet, drinks, food, and VIP viewing area.